Some of the names pictured: Tony Brasil, Brian Winterbourn, Eddie Newland, Mickey Malone, Jimmy Smith, MR Carolan, Bernard Trangmar and myself, back row second from the right. Anyone remember this photo? If it’s the Tony Brasil who lived in Whitehawk, he was my cousin Connie’s (nee Bishop) husband – now sadly both no longer with us. Although I didn’t know him that well, Tony Brasil was a very good boxer so I was told by my Mum Winnie (nee Gravett). His mother-in-law was mum’s older sister Nellie who lived in Whitehawk and then the Bristol Estate. Connie, his wife, and her older brother Arthur were rescued from the bombing after the cinema was hit in Kemp Town where they had sneaked off to without permission. Arthur was a policemam and Connie was a nursing sister at ths Sussex County . Of course, I remember Tony very well, he was our trainer at St. John The Baptist and a very good one at that. I believe, that he had a younger brother, that also was a very good boxer. Fond memories of them all. I remember Tony Brazil from my days working as an apprentice on the SEEBARD 1952-1957. Tony was a labourer digging holes for the electricity mains (good training for boxing), another Brighton boxer Dave Elms (heavyweight) worked with him. Together they could dig holes faster than a JCB. I seem to remember Tony losing a fight to the great Randolf Turpin. I also have a photograph amongs the crowd taken at the Whitehawk pub. Hi everyone. I would just like to say that Tony Brasil and Connie were my grandparents but are sadly not with us any more. I would be interested to know a little more about the good old days. Hi Tara. If you can get in touch with Jennifer on the B&H team for my email address I could email you loads of photos etc, of lots of your late relatives, plus some still alive and kicking. As we must be related because your grandparents were my cousins it would be nice to get in touch. Have a look at the Gravett family on the Local Folk site as they were your G.G,G.Grandparents. Hope to hear from you soon. Pat. Hi Eddie, I recognise you from the photo. I also well remember the name Mick Malone, although I can’t identify him. Yes I remember Mr Crowley and Mr Lidel (teachers). My best mate Bill Warner, now a Sussex CID chief inspector, was managed by Tony Brazil when he turned Boxing Pro in the mid seventies. I remember him as a nice guy who was well known and liked , a real character . Is that the same Mr Crowley who was a maths teacher at Fitzherberts in the mid 1970s? This is fascinating. I was at SJB in the 1950s, and in the ATC, although I didn’t box. Brian Winterbourn, if I remember, was tops at nearly all sports. Teddy Waller (as he was known then) was also a good footballer. Does anyone remember the ATC trip to RAF Hucknall in Nottingham? I went up in an Anson, a Canadian Air force Bristol Freighter, and one other plane which I forget; maybe an Auster. One of our group, ‘Baldy’ Knight, was airsick in a meteor jet and spewed into his oxygen mask. My memory tells me that Joey Allen was so nervous he pulled out the Daily Mirror to read on his flight (not a jet, no mask) and this irritated the pilot so he landed early. Great times, thanks Eddie. James Jeffery. Tony Brazil was my old dad who ran Whitehawk Boxing Club. I always remember going to midnight Mass at St John the Baptist Church with him when I was a kid. I also remember boxing for Whitehawk School against St John the Baptist when I was younger. Dad had three brothers all who boxed at some time, but it was his older brother Tommy who introduced to him to Boxing, and the old kid always idolised him. Unfortunately he got killed in the war. 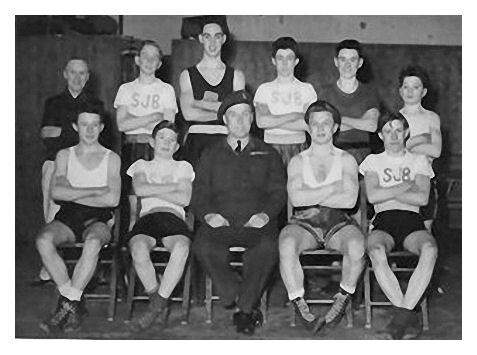 His other brothers, Johnny and Freddy, also boxed and I’ve got a picture of Johnny when he was coaching the St John the Baptist Boxing team, it looks to be in the 30s or 40s. Unfortunatly all have passed away now, but my youngest daughter Janie decided to pick up the gloves and was Womens’ Amatuer Middlewight Champion recently, she has got a website I think. So she is following in her old grandad’s footsteps, I think he would have been well tickled. Hi Eddie, I don’t think we are related but I have a question for whoever can help. I’m looking for info on my dad Donald Waller, who boxed for the team in the 1960s and went on to win the ABA Championships 2 years on the trot. If anyone can help me, I would be grateful. Tony Brasil was my Great Uncle on my Dad’s side. My Grandfather was Arthur (Patrick Collin’s comment above). I am so very proud of my family history. I remember Aunty Con but not so much Tony as he was ill in hospital with Alzeimers when I was a child, but I do remember Grandad going to visit him. Great that people still talk about them. Unfortunately my grandad (Tony’s brother in law) also passed away in 2004. I remember meeting Tony Brasil as a child with my dad Dennis Butler. They were very good friends, we lived on the Bristol Estate. He was always joking from what I can remember. My dad passed away in 2006. I have lost touch with my cousins in Brighton whose father was Peter Butler (my uncle). I remember being a very young boy living in Manor Road and Tony used to walk past and talk to my dad often and always used to put his guard up to me and say ‘do you want to fight?’, my old dad said Tony was a very good boxer in his day, it always put a smile on my face as a young boy. I believe from memory he lived in Maresfield Road. Some characters you never forget R.I.P. I remember Dennis Butler, he used to work with my dad. I think that they did plastic ceilings and plastering. I think he moved to Ireland in the late 1960s. Yes that is right my dad Dennis used to do artex ceilings, so Tony probably did work with him. I remember being in Tony’s house at the top of the hill and I think a white boxer dog. Sadly my dad passed away in 2006 but he visited Brighton in March of that year and was asking about Tony but he was really upset to find out that he had passed away. Dad moved to Ireland in 1977 but always liked to come back to Brighton for a visit. I grew up with Micky Molony. He lived in Whitehawk Ave with his wife Pat. His son was into kick boxing and was very good. I keep going over this picture and can’t see my dad Tony in it. The date of the photo is 1954. I knew Tony Brazil the boxer around the Whitehawk and Manor Farm area and he is not in the photo. For a start he would have been a bit older than these lads. I went into the seniors at St. John Baptist in 1954. Tony Brazil was very stocky and a nice bloke as well, and would always say hello when he passed you. That is not Tony in the photo, it’s Johnny Brasil.